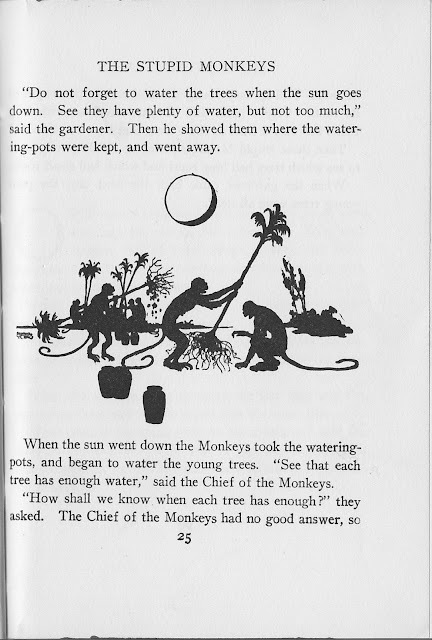 Just fell in love once again with Ellen C. Babbitt's two Jataka Tales books. This came after my telling Indian folklore to open a play I was in and also after an interesting discussion about telling or not telling the moral of story. I'll say more after this very brief example. I intentionally left the book edge showing in this final page as it shows my "sticky note" in the front of the book. More on that after returning to the comments made at the start of today's article. Look at this story. Would it gain or lose by stating a moral? What moral would you give it? The point isn't necessarily the one the teller had in mind. 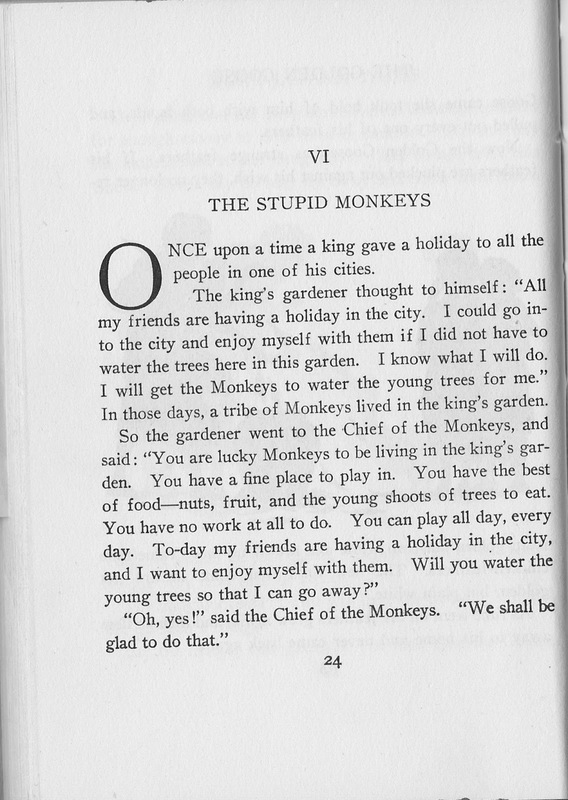 Proverbs are a great story starter and many books of fables do give us the intended moral for stories. At a recent storytelling meeting the story of getting an animal to dig until they have dug a pit too deep to escape was told. In this case the digger was a tricky fox -- always a creature good to represent creativity and sly intelligence. The story ended with the fox stuck in the pit and the moral was stated that "There's always someone smarter." That's a good lesson. It brought the story to a close with a snap! Sometimes that's what is wanted because a fable, by its nature, is a teaching story. The drawbacks are the three possibilities named earlier, although the third option tends to be the same as the first. The possible benefits are that your audience will know what you wanted them to remember and it also is a bit more memorable. The fellow storyteller who used it on his digging fox version caught me so off guard that it took me several days to remember the story itself instead of just his stated moral. In the recent show, one of the tales I told, "The Pigeon and His Turtle Dove Wife", was from another ancient Indian collection of teaching tales, the Panchatantra. The setting for the show was to be at a wedding reception. Essentially the story, like the familiar "City Mouse, Country Mouse" has a pigeon leave his home-loving wife for a series of adventures that all leave him eager to return home. I chose to end with "East, west, home is best." Didactic? Yes, a bit, but it gave that snap of conclusion and showed how it fit the setting, letting me go on to another more modern example from Indian culture. 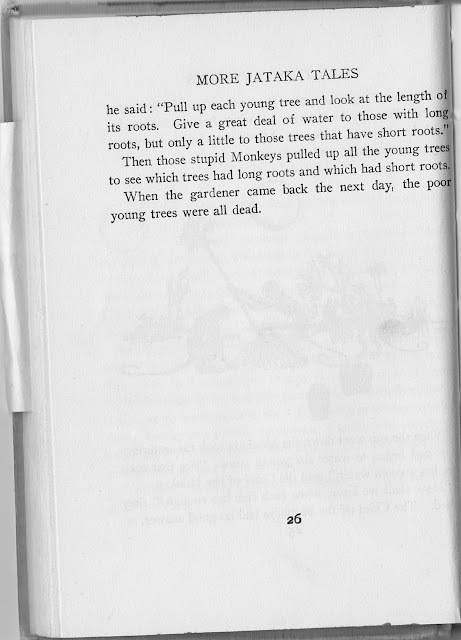 The two books, Jataka Tales and More Jataka Tales, are easily found online and I've given hotlinks, but Ms. Babbit made it clear in both books she was retelling the work of other translators, the Cambridge scholars of the Sanskrit "Guild of Jataka Translators" directed by Professor E.B. Cowell. If you go to that work you get the subtitle: Stories of the Buddha's Former Births. She omits that aspect in her retellings. If you want it, then a more academic translation, like Cowell's, is wanted. Personally I love the way her tales return to teaching (and in an entertaining way) everyone without limitation for age or religious outlook. 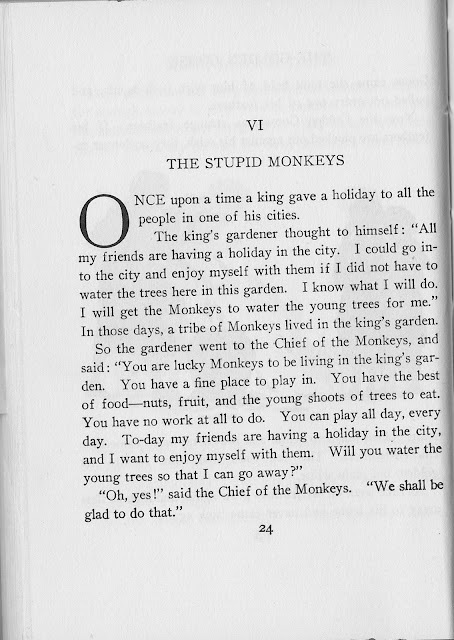 There's a reason the Jatakas have been among the earliest literature and have spread so widely throughout international folklore (Aesop, Boccacio, Chaucer, et al). 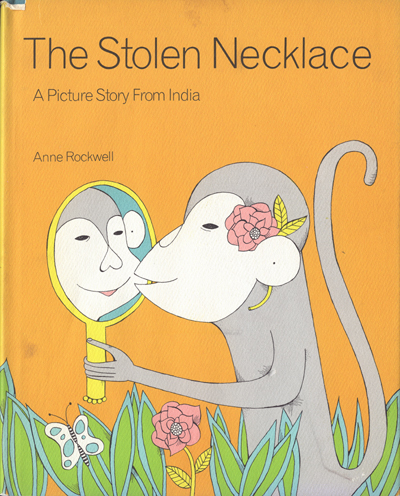 Both the Jatakas and the Panchatantra are animal fables illustrating the wise conduct of life. - the Elephant and the Dog (just a lovely little story of animal friendship). With or without a stated moral, don't let that stop you from enjoying them!